The 2JR midpipe replaces the restrictive factory midpipe and catalytic converter with a larger, 70mm stainless steel mandrel-bent system, featuring a stock flange that bolts to the factory catback or aftermarket/2JR catback. Expect better throttle response, more horsepower (+12whp dyno proven w/o a tune) and an intoxicating exhaust note, while remaining civilized during normal daily driving. It’s one of the best performance upgrade for the Juke. All 2JR parts are designed and assembled in-house, using premium materials and world-class manufacturing techniques few can match. This midpipe, like all our exhaust parts for the Juke is manufactured from 70mm T304 anti-magnetic stainless steel that is less susceptible to discoloration when compared to other systems found on the market. This quality T304 stainless steel is used on all of the pipework including the construction of the flanges. Mandrel bending ensures full flow bends for better exhaust gas flow and 2JR systems are increased in bore (70mm) to ensure the ultimate performance without the loss of mid-range torque. This is the perfect size for the MR16 engine. This midpipe powers our own Juke to over 360ft lbs and 300hp. Exhaust tone has ZERO rasp, excellent tone quality without being loud - when paired with our downpipe and catback exhaust. Fit all years - Juke 2011 to Current Models. All ranges (S, SV, RS, Nismo) , with turbo 1.6 MR16DDT. 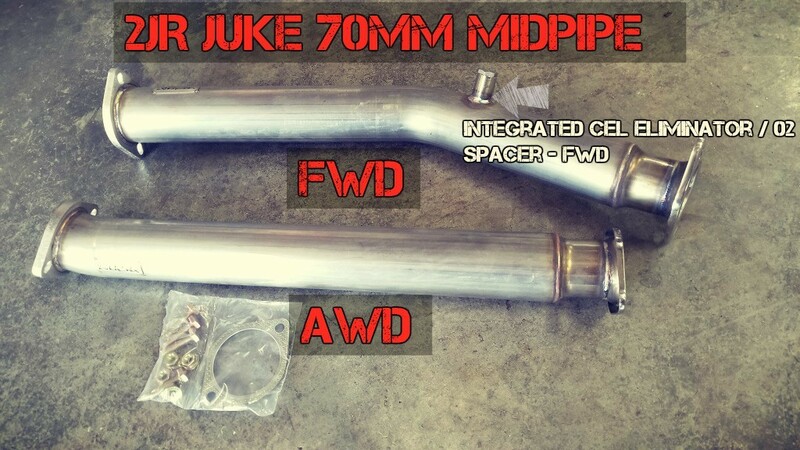 2JR is pleased to present the ultimate 70mm midpipe for your AWD or FWD Juke The 2JR midpipe replaces the restrictive factory midpipe and catalytic converter with a larger, 70mm stainless steel mandrel-bent system, featuring a stock flange that bolts to the factory catback or aftermarket/2JR catback. Expect better throttle response, more horsepower (+12whp dyno proven w/o a tune) and an intoxicating exhaust note, while remaining civilized during normal daily driving. It’s one of the best performance upgrade for the Juke. All 2JR parts are designed and assembled in-house, using premium materials and world-class manufacturing techniques few can match.